In 2005, at the age of 25 years-of-age, Daniel Shynkaryk became the youngest head coach at the Legion Athletic Camp. He has held this position ever since. For eight years he has attended the Legion Athletic Camp as an assistant coach and prior to that he also attended camp as an athlete. His passion for the sport has led to success both on and off the hardwood. In 2003-2004 he coached College Jeanne Sauve to a Manitoba high school junior varsity provincial title. An alumnus of College Jeanne Sauve, he had only a few years prior led them to a Varsity provincial title as a player in 1997-1998. After a brief stint playing for the Brandon Bobcats (1998-99) in the Canadian Interuniversity Sports (CIS) ranks, Shynkaryk took some time away from the university scene only to return with a big bang in 2004 with the Winnipeg Wesmen. The 6-foot-8 centre dominated the CIS scene (2004-2008) and was named to several all-star tournament teams. 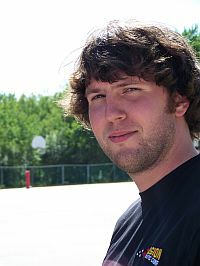 Dan is currently teaching and coaching at Tec Voc High school in Winnipeg. He's coaching the Basketball Academy and coach of their Varsity Boys Basketball team. Of his coaching philosophy he states: "I coach because I like being around young people. I enjoy their enthusiasm for the sport and their willingness to learn. Seeing them succeed and learn is a great feeling for me and I know what it's like to be in their shoes." and foremost Shynkaryk wants to make sure that "fun" is a top priority for all players. "My coaching philosophy is to learn and have fun. I want kids to leave this camp as an improved basketball player and even a better person. I know that when I came to this camp I learnt some very valuable life lessons and I think that every kid should have the opportunity to reach their potential. 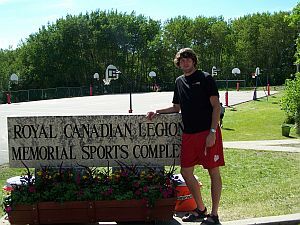 "The Legion Sports Camp is proud to have Daniel Shynkaryk as a head coach for basketball.